When we were first approached about a new organ for Nigawa Gakuin School, it was clear that this would not be an easy commission. The multi-purpose room into which the organ was to be built had not been designed to accommodate a pipe organ. Whilst there is a gallery at the back of the space, it does not have sufficient height to accommodate a pipe organ, so we had to look at the chancel area. The chancel is formed by an apse behind the stage area. When the building is used as a theatre, cinema or assembly room, curtains are drawn in front of the chancel, and one would not know that it was there. Once the curtains are opened, the room takes on a new role and perspective. This was where the new organ had to be placed but the space was hardly ideal. However, having visited the school, means were found by which the problems could be overcome. It had already been decided that the organ would be in two parts, the Manual Divisions in the right hand case and the Pedal Organ in the left hand case. In order for the tracker connections to be made and to gain a some space for the altar once the organ was installed, it was suggested that the altar be moved to the very front of the chancel area, and that moveable steps, incorporating a platform area be made, to be set in front of the chancel, effectively enlarging the chancel when it was in use. These changes proved very useful in making the best use of the space available to the chancel and organ. The hard surfaces of the chancel and the polished wooden floor of the stage ensures that the sound of the organ projects well into the body of the room. The room itself does not display any specific characteristics which might have been reflected in the case design, so this was conceived independently of the room in combining contemporary and traditional elements unique to this project. The pipe shades in particular are fretted to contemporary designs and incorporate a number of relevant elements. The school is a Roman Catholic foundation, so finding motifs was not difficult. Both centre towers have the emblem of the school (an eagle) with the letters N and G for Nigawa Gakuin. On the Pedal case, the left hand tower represents the sun and the right hand tower the moon and stars. The flats have raised elements in a darker wood, the left pedal one representing Christ the King and the right hand one the Virgin Mary. The left hand tower of the manuals case represents water, the right hand one fire. The raised elements on this case represent St Francis of Assisi (left hand) and Alpha & Omega (right hand). 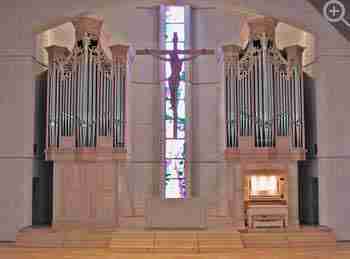 The organ is designed to be versatile and will be used for teaching as well as the accompaniment of services in the chapel. Trackers for the Pedal run underneath the floor together with the wind trunks. The Great Organ is in the lower part of the manuals case with the Swell Organ above. The manuals key action is suspended as this lent itself naturally to the internal layout of the organ. The drawstop action is electric incorporating a 64-level capture system. 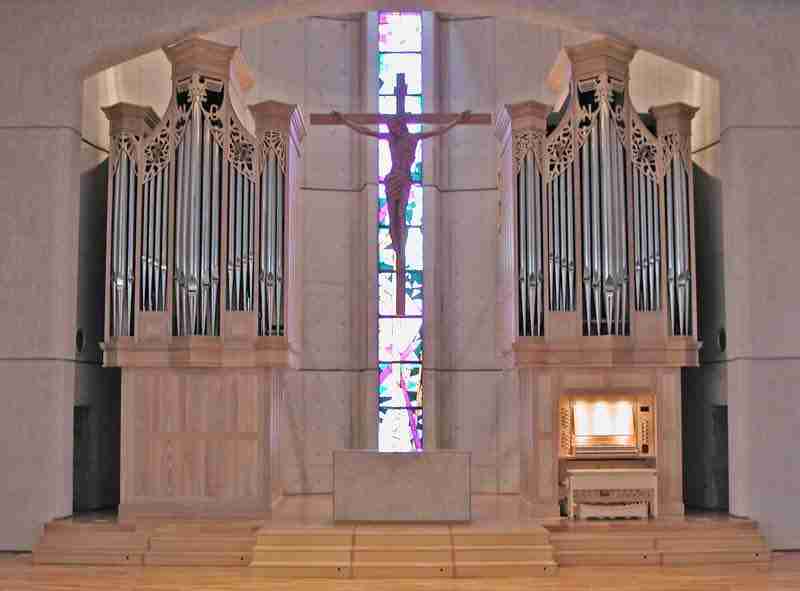 View the Specification of the Nigawa Gakuin School organ (completed 2005) and pipe scales.